Santa needs a holiday too. So, this year he has decided to take off to Africa! As for the Christmas presents which he has sworn to distribute, he needs two trusted people to help his elves drop presents through the chimneys. 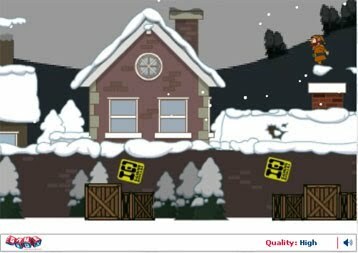 Chimney Capers is a turn-based, multi-player game in which you help Santa’s elves drop the prezzies – but here’s the catch! You only have a minute to complete the job. So, spread all the joy you want in a minute and make Christmas all the merrier! Left-click to make the elf leap on to the chimneys. There must be maximum chimneys covered within one minute.